In the fall of 2016, the Southern California Association of Non Profit Housing (SCANPH) honored W.O.R.K.S. 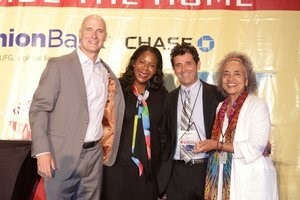 with its prestigious Homes Within Reach Developer of the Year Award. The award, presented at SCANPH’s annual conference, recognizes “excellence in affordable housing” in the southern California housing community. The Southern California Association of Non Profit Housing’s mission is to facilitate development of affordable homes across southern California by advancing effective public policies, sustainable financial resources, strong member organizations and beneficial partnerships. Southern California has an acute need for affordable housing. In Los Angeles County alone, there is a shortage of 551,807 rental homes for household earning less than $41,500, and more than 47,000 homeless people. SCANPH is at the forefront of major policy initiatives in the region to address this crisis. WORKS was founded in 1998 as Women Organizing Resources Knowledge and Services by a group of women committed to developing affordable housing communities that would allow disadvantaged families and communities to build lives for themselves that work. Since 1998, WORKS has developed more than 1400 unites of affordable rental housing in Los Angeles County and in Oregon.